Posh striker Jack Marriott shoots at goal while under pressure from Leicester's Danny Simpson. Photo: Joe Dent/theposh.com. Peterborough United manager Grant McCann hopes his players will learn from the footballing lesson handed out by Leicester City in today’s (January 27) heavy FA Cup fourth round defeat at the ABAX Stadium. Posh were crushed 5-1 by a Leicester team showing 10 changes from their last Premier League line-up. A dreadful start saw the visitors roar into a 3-0 lead inside 30 minutes with two late goals adding gloss to an impressive display from the top-flight champions of 2015-16. Posh goalscorer Andrew Hughes heads at the Leicester goal. Photo: David Lowndes. 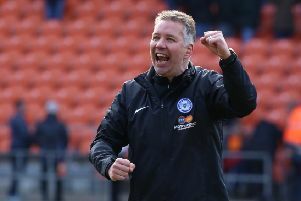 Andrew Hughes briefly gave Posh hope with his second goal of the campaign, but McCann, who was managing Posh for the 100th time, admitted Leicester were worthy winners in front of a rare capacity crowd of over 13,000 at the ABAX. “We gifted them two early goals which effectively killed the game off,” McCann conceded. “We made mistakes which we might have got away with in League One, but this standard of footballer will punish you. “We were under no illusions about how hard this game would be even if they made lots of changes, but we didn’t do ourselves any favours. Players don’t make mistakes on purpose, but to be successful you can’t give away the sort of goal we did today. “There is no doubt Leicester deserved to win. They were outstanding at times, but for all their possession and good play we actually gave them their goals in the first half. Posh fans before the FA Cup tie against Leicester City. Photo: David Lowndes. “Credit to the players for managing to respond in the second-half and for for 20 minutes we showed glimpses of what we can do. We made a couple of changes and the lads dug deep, but like all good sides, Leicester managed that tricky spell very well and went on to finish strongly. “It was heartbreaking for us because we had attracted a big crowd to our ground. But as so often happens with us, when the attendance is big we don’t perform. This was a great chance to make sure many of them come back to help us get where we want to be in the league and we didn’t do it. “Many of those supporters came looking for an upset we felt we could provide, but we didn’t do anywhere near enough in the first half. We were lucky to only be 3-0 down at the break. “It now has to become a learning curve for us. We have to watch how Leicester pick out players in great positions when they have attacking opportunties around the penalty area. Too many of our good positions were wasted by hopeful rather than accurate passes. They are critical moments in games and we weren’t good enough when it mattered. Posh right-back Liam Shephard tries to rally team-mate Leo Da Silva Lopes during the FA Cup tie with Leicester. Photo: Joe Dent/theposh.com. “When we are in possession we all need to be good teammates and move into an area where they can receive the ball. We drum that sort of movement into our players, but Leicester were much better at that today. Posh are next in action at home to Southend in League One next Saturday (February 3). Charlton and Rotherham didn’t play today so the gap to the play-offs remains four points.